It’s been a long thirty days. Today is the last day of Childhood Cancer Awareness Month. I understood going into September that this national, annual campaign is an opportunity to capitalize on people’s attentiveness. To educate, to advocate, and to fundraise for research. This was true last September as well, and during the Septembers when Benji was here, and on treatment. But this year I went in with both barrels blazing. I had a strange fire burning to make this month count in a big way. Events every weekend, meetings several weeknights, articles, interviews, photographs, ribbon cuttings, luncheons, visits to classrooms. I knew I would have to pace myself, protect my heart. I went into the month wearing a banged up suit of armor. I barely made it through. Sometimes I wonder if I’m making myself even more crazy with all of this. I already struggle so much with reality and time, and I question my sanity constantly. I am terrified of my own thoughts sometimes as the months continue to mercilessly progress. Is it normal–or, more importantly, is it healthy–for me to immerse myself into the world that claimed my son’s life? Probably not. None of the other parents I know whose children died as recently as mine are handling their grief in this way. They are doing much more reasonable things, most of which involve silence, stillness, and self-preservation. I try to strike a balance there too. But the advocacy and the fundraising is who I am. It’s what my life until now prepared me for. And it is serving a very valuable role for me personally, aside from the greater good: this work is giving me a sense, whether false or real, that in the face of my immeasurable guilt, I am doing something. It will never be enough, but it is something. I honestly believe that The Benjamin Gilkey Fund will save a child’s life, maybe as soon as next year. I dream about the day I find out about that first of many successes. I imagine the joy that will fill that mother’s heart. I let it fill mine up for a moment, and warm its walls. I crave that feeling. My suit of armor protects me against most catalysts, at least in the public eye; but the thing that breaks my emotional resolve every time is the the sight of a mother being present with her children. Absorbing a small moment that will disappear. Finding joy. I’m so grateful for Michael and Banyan. They support this abnormal healing process and believe in its value. They’ve both been put through the ringer this month, asked to be in the spotlight, on camera, giving quotes, accepting “comically large checks” in front of sports fans. We’re in this together. And while we’re all grateful for the rest and reflection October will bring, we have so much to celebrate as a result of these last thirty days. We don’t have an exact total, because checks are still coming in, but in our estimation, September’s events will have added between $50,000 and $60,000 to The Benjamin Gilkey Fund for Innovative Pediatric Cancer Research. To everyone who was a part of this crazy month–and that’s a LOT of people, hundreds of you–THANK YOU. 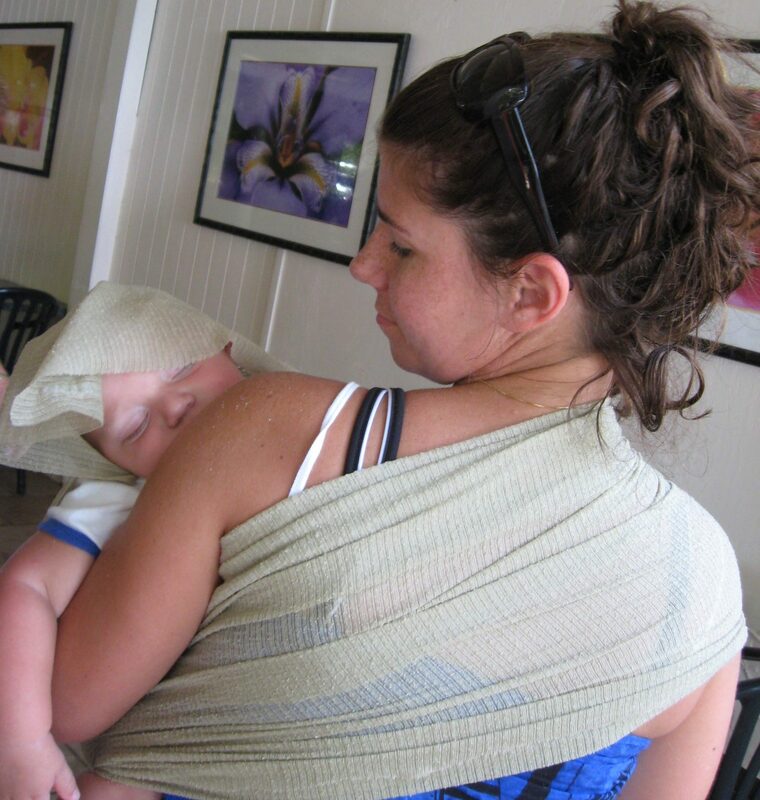 My dear friend reminded me that it was Benji’s birth that propelled me into a chapter of fundraising for maternal health, and that I carried him in his sling on my hip, at my side, during those passion-driven efforts. I held that image securely in my mind throughout this month, as his death has propelled me into this very different, excruciating direction. I’m certain that as I carried him, he carried me. I’m grateful that October’s deep breath will come just when I need it most, as Halloween and Thanksgiving and Benjamin’s eleventh birthday and Christmas and the anniversaries of his diagnosis and death all follow the turn of this calendar page. I plan to immerse myself in silence and stillness. I plan to find myself deep in the woods as often as possible. Then, next September, we’ll do it all again. I’ll be ready. Our friends at Johns Hopkins All Children’s Hospital produced a video about The Benjamin Gilkey Fund this month, and about the advent of CAR-T immunotherapy and the opening of the new Research and Education Building. We’d like to share it with you now. We’re grateful for the message of hope that their production team was able to strike. We feel it too. I miss my son. That’s the bottom line. My heart breaks anew each morning when I wake up and he’s not here, and then again at the end of each day, when I have to figure out how to fall asleep amidst the thoughts competing in my head. I spend every hour in between trying to focus on the gratitude, and it is exhausting work. I know that what we are doing with The Benjamin Gilkey Fund will save another family from feeling this way. That’s everything. It’s all we can do. And we’ll carry him with us, every step of the way. Your words, the video, advocacy, and fundraising altogether reflects everything you are – selfless, passionate, inspiring, and courageous. $50,000-$60,000! That’s Amazing! You’re amazing! You did so good, mama! Now find your balance, your woods, your silence, and rest. Every choice you are making is the right one. I believe Benji’s love surrounds you, Mike, and Banyan each and every day. I love you. I’m in awe of the work you’re doing. Thank you. Hi, I am doing the family history on Ancestry, and would like someone in the family to contact me so I can update my files. Thank you and Happy Holidays !